What I thought would be a simple one week project has instead, after three weeks, taken on a life of it's own. Matt, Jack & I are writing a short story this summer...sentence by sentence. It's taken some weird, but fun, turns and I know we are going to love it when we finish (although I believe it will be hard to decide exactly when to finish). Seriously, that's it! A notebook, a pen and a few willing writers (more than one kid writer in the mix would be great too). We leave the notebook on the dining room table and each day we grab it when we have a free moment and write. The only catch is...you can only write one sentence per day. It can be really hard to stop yourself after one sentence! And let me tell you, the story is never where you think it will be when you return the next day either. It's a lot of fun to see what my collaborators dream up. Our story has gone from baseball games to alligator encounters to rainstorms. New characters have been added too. This project has been really wonderful as a way for all of us to use our imagination. It is quick & easy to do whenever we have a minute and is something Jack does on his own during the girls' nap time. But despite the fact that we each work alone, we talk about it as if we are writing as a team (and it is something we talk about often because we all think it is turning into a really fun story). 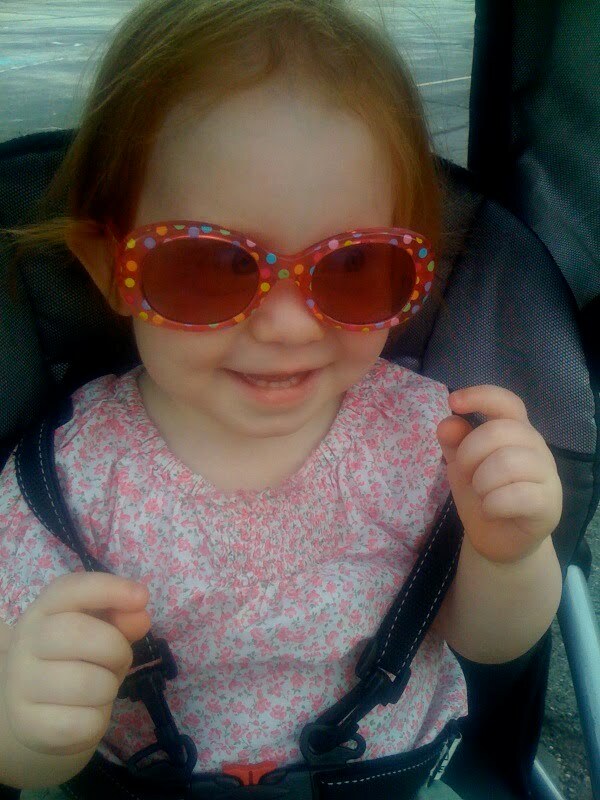 This is a project that will be repeated every summer (until the kids refuse to do it anymore) for sure! It seems that week is all about correspondence. We made our own envelopes, it's our week to send postcards for the first swap, and I have some long overdue thank you notes on the "must do" to do list! The perfect week, especially with the 4th of July coming up, for us to send cards to people serving overseas in the military. It was something I had on the list of ideas for our Help projects, but I really had no idea where to begin. After some web research, I found Any Soldier which is a site where you can get addresses, wish lists, and more. Each soldier listed is someone who volunteers to help. So you send mail or packages to them and they distribute them to others. Jack and I requested two addresses...one Army and one Air Force...and each wrote a letter to them. I hope they get there quickly and are a tiny bright spot in someone else's day. Jack's are incredibly cute, but he wanted to keep them private. Oh and he included my email address on them in case they wanted to write him back...that would be really cool! and don't mind taking apart! That's right, the first step is to "open up" your envelope by undoing all the seams. Lay it on top of paper you'd to make into an envelope and trace it. Then fold your new paper up again into the envelope shape. Tape along the seams (or you could use double-stick tape or glue sticks on the inside of the seams for a fancier look). And you're done! I cut a sheet of cardstock into 4ths to fit inside our envelopes (and to give them some weight) as note cards too. We used pages from a magazine for our envelopes, but you could use lots of great things. Maps, wrapping paper, packaging and newspapers would all make cool envelopes too! I love how bright and cheery ours turned out and can't wait to send them off to liven up some mailboxes! T-ball is done for the season and it was a blast! Our small team (only 7 players versus 11-13 on the other teams) really worked together and went from strangers to a true team. Jack loved every second and we had a couple really fun things happen to wrap up the season. 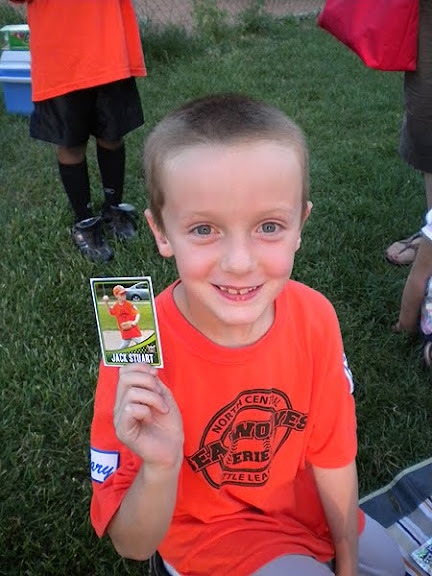 The first was a surprise from Auntie Sandy...Jack's own baseball card (which she designed & then hid in a pack of baseball cards). Jack tried to play it super cool, but I think his grin in this pic says it all! Then last Tuesday, Jack & I had a date (Grandma watched the girls) at his absolute favorite place. He didn't get to bed until 11:30pm. But first he got to walk the warning track with a gazillion other little leaguers! We had a small group representing, but they had a great time for sure! Thanks for a great season Sea Wolves! 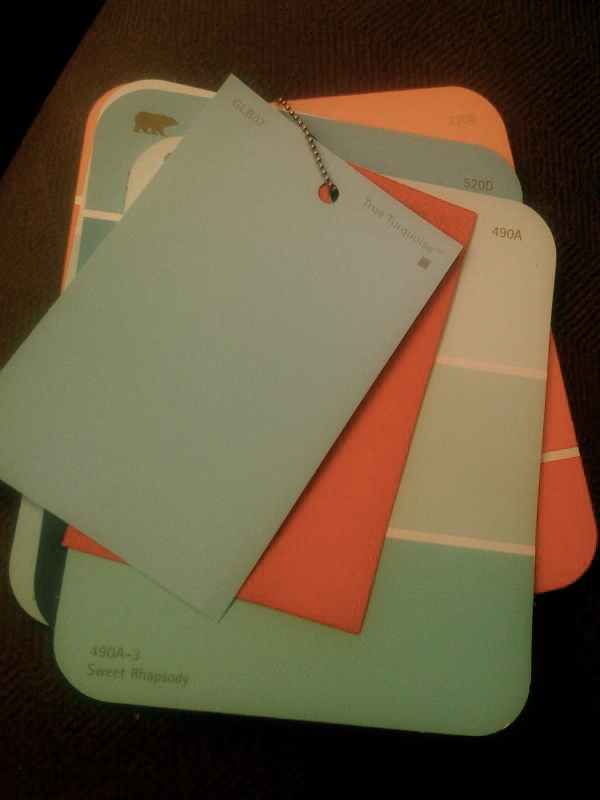 -color scavenger hunt at Goodwill (which honestly was the "Help Mom find possible accessories for the new living room" hunt) - slow start but then they gained steam. We found lots of things in the colors, but nothing we wanted. The booklets were the biggest hit of the hunt...I may have another hunt idea that could use them! -Betty Brinn for Rosie the Dog Gets a Check-up! 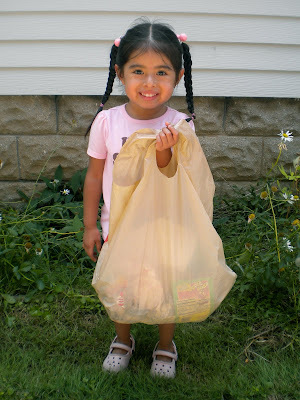 -trash clean-up day on our morning commutes/walks (our street had NO litter... YAY!!!) - the kids loved this project (including a friend who walked home with us from Spanish class), I highly recommend it! Grandma sent the kids a little project (which I agreed to as it was just 2 weeks with "pets") and it was definitely a hit! We raised 10 little butterflies and Jack & EJ loved every second of it! The only spot on the first floor where they wouldn't be in the hot sunlight and wouldn't be knocked over all the time (although Matt & I both walked right into it quite a bit the first day or so). Hatching has begun (sorry about all the random blood in these pics...who knew that butterflies left meconium behind...gross!). there was still a lot of this going down around the table for the last few days! The kids got a few extra days with the butterflies due to rainstorms and wanting Daddy to be home for the big release, but this morning was the perfect time to say good-bye. The butterflies didn't really seem to "get" flying out, so we ended up taking them out and setting them on the flowers in the garden. Then they flew away one by one. Matt transferring the butterflies (I think they would have hung out on our hands all morning). 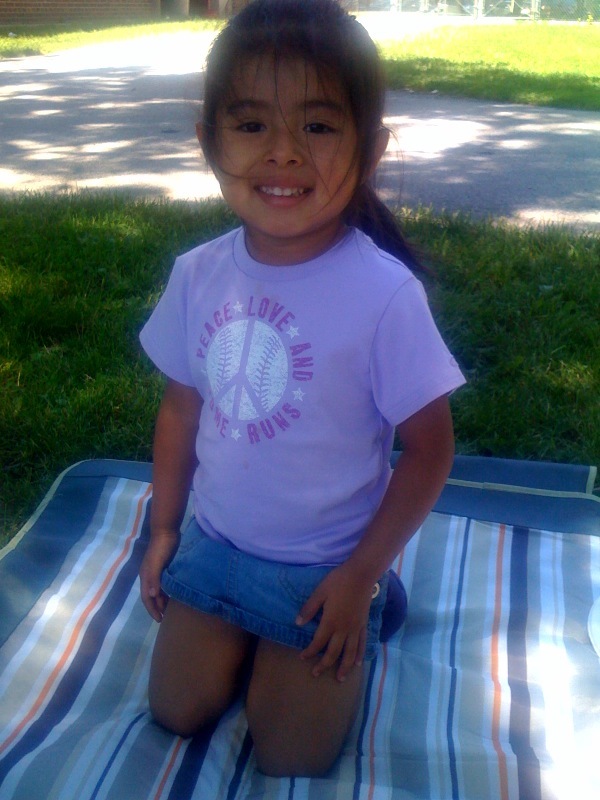 Of 10 butterflies, we did have one problem. The paper disk folded over on this guy and only one wing came out. We thought he may have died (we didn't see any of the other ones emerge, so we assume it's a fairly quick process). because he only had one wing. Poor "One Wing" (as we named him)...but the thing is, he really adapted and got around well. When he drank the sugar water, he tended to lay on his side, but he could climb up to the top of the habitat and by the last day, he could even walk around (before that he was toppling over a lot). We let him go by low flowers and are hoping for the best for him. He was gone about 3 hours later (Jack checked & thinks he found a better home). Overall, this was a great experience for the kids (and a nice positive one after our last animal encounter where we had dead tadpoles!). They had a lot of fun watching each stage and talked to the butterflies each day at the table this week. There were some tears after the release this morning, but also a lot of talk about how happy the butterflies would be out in the world! 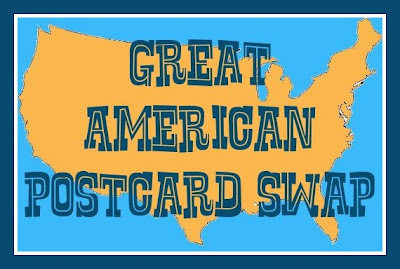 This Spring I joined two Great American Postcard Swaps. and group #4 of this one. And then I promptly got so busy I couldn't even see straight and freaked out wondering why I get myself into things like this! It sounded like such a great idea at the time, but now... Let's just say I thanked my lucky stars that my turn to send wasn't for some time and started stashing away the postcards we received in the black hole that is my desk! Thankfully school ended and although we are busy, it's much easier to take time and make sense of that black hole. So, Jack and I spent nap time pulling out the postcards and organizing them. We had a lot of really cool ones, so we spent some time putting them in state order, reading the cool facts on the back, and checking out the great photo fronts. 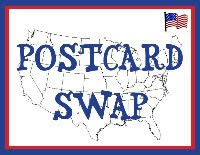 Then we determined which swap they were from and marked them on these great USA map postcards I purchased (back when I first signed up and was organized). Blue is for the 1st swap and orange is for the 2nd (luckily the 2nd swap has just begun and is going in a different order). We are using this map to locate the state before marking them off on the maps. 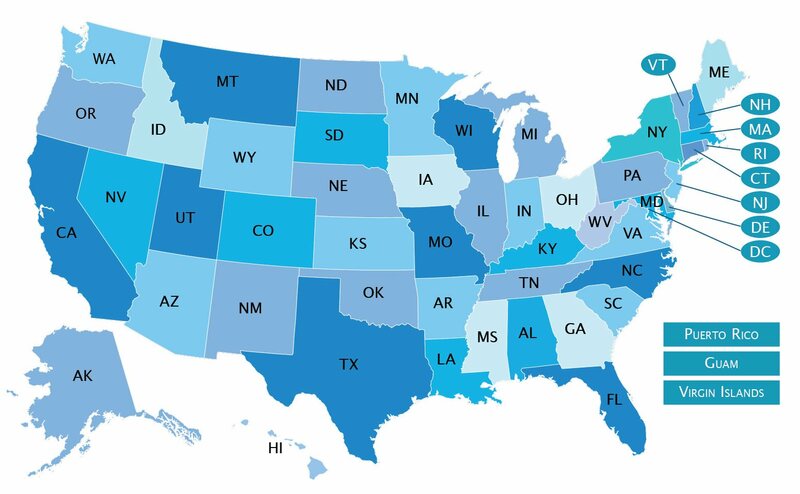 I'd like to pretend we only use this map for Jack's benefit, but that East coast (and all those tiny states) get tricky! I had recently purchased this large frame from Ikea (no use in mind, just a great color/size I thought I could use with the kids) and I put the plexi behind the white label paper that came with the frame. It makes the perfect spot to house our map postcards and store the received postcards, while showing off some of Jack's favorite ones. Jack has been switching up the "featured" cards every afternoon and the frame now sits on his desk, so I'm pretty sure this project was indeed a hit. Guess I'm glad I signed up after all (although you probably shouldn't ask me that when it's our turn to send out 50 postcards)! I bought this little patio set for our deck. It's nothing gorgeous or lush, but it met our main needs. Those needs being: that it seats a couple people in a small space, that it is metal so it can be out in all kinds of weather (we have no canopy over the deck), that is can be stored easily for winter (both table & chairs fold up) and that it is incredibly inexpensive! It met all of the above. However, what it is not is incredibly eye-catching or pretty. So...keeping in mind that I live with a very conservative man and kids of both genders, what color should I spray paint this set to liven things up a bit on the back deck?